Spent the day in Hilo running some errands and some shopping. 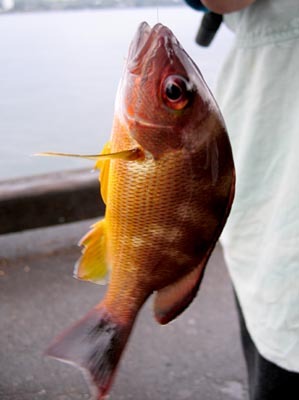 Came upon a group fishing in Hilo Bay and a lady hooked a fish. 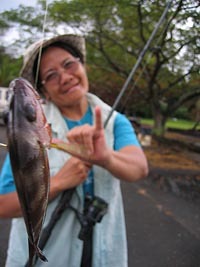 I asked to take a photo and at first she asked if I was with some kind of FBI or government group regulating fishing so I told her ‘nah’ and she proudly held the fish out. The other guys fishing at first joked that she should throw it back as it was too small. Actually getting the lady AND the fish wasn’t so easy, the fish kept jumping and spinning around. A grey day on the whole island and probably the state as a storm front moved in over the island chain. Click on the above image to see a 360 degree shot from Liliuokalani Gardens in Hilo. Had to meet Chika later for some photo help since her camera is somewhat broken. Lent her a camera and I was off back to Kona. Previous PostPrevious Do you feel lucky? Punk?